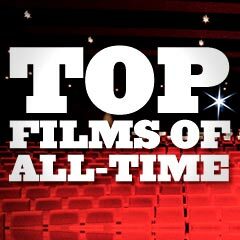 The Top Films of All-Time: This section presents an overview of the rankings of films regarded as 'greatest' by other critics and film-makers' polls, box-office totals, awards organizations, and other tallies. (Not all entries are listed - these are only a representative sample.) Although this website doesn't strongly believe in the value of ranking films, it is nonetheless interesting to see how a certain number of films often appear at the very top of the rankings or ratings. 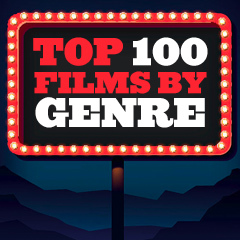 the site has selected as the "100 Greatest Films". The Empire Strikes Back (1980) - the top-ranked 'action film' in IMDB's Action Genre listings (as of 2010); rated as the # 12 action film in Entertainment Weekly's 2007 issue of the "Top 25 Greatest Action Movies"
The James Bond films - from 1962 to present, has been rated by the Guinness World Records as the "most profitable" film series of all-time (although the Bond films have been superceded since by Marvel's Cinematic Universe, the Star Wars franchise, and the Harry Potter franchise); for example, Goldfinger (1964) rated as the # 19 action film in Entertainment Weekly's 2007 issue of the "Top 25 Greatest Action Movies"
Monty Python's Life of Brian (1979) - voted # 1 comedy in 2005 in Channel 4's "50 Greatest Comedy Films"
National Lampoon's Animal House (1978) - voted # 1 comedy by Bravo's "100 Funniest Movies"; ranked # 36 in AFI's 100 Years...100 Laughs ranking in 2000; voted # 47 comedy in 2005 in Channel 4's "50 Greatest Comedy Films"
Dr. Strangelove Or:... (1964) - ranked # 39 in AFI's 100 Years...100 Movies (10th Anniversary edition) polling in 2007, a list of the 100 greatest English-language movies; ranked # 3 in AFI's 100 Years...100 Laughs ranking in 2000; ranked # 14 in Entertainment Weekly's "100 Greatest Movies of All Time" book published in 1999; ranked # 26 in AFI's 100 Years...100 Movies polling in 1998, a list of the 100 greatest English-language movies; voted # 29 comedy in 2005 in Channel 4's "50 Greatest Comedy Films"; voted # 53 comedy by Bravo's "100 Funniest Movies"
Fahrenheit 9/11 (2004) - currently the highest grossing documentary of all time, and the Palme d'Or winner (the second documentary to win that award); voted # 8 in 2005 by Channel 4's polling of "50 Greatest Documentaries"
Bowling for Columbine (2002) - at one time, the highest-grossing documentary of all time, until surpassed by director Michael Moore's next film Sicko (2007); in 2002, it was the first documentary to compete in the Cannes Film Festival's main competition in 46 years; won the Best Documentary Feature Award at the Oscars; ranked # 1 in 2002 by International Documentary Association's "20 All-Time Favorite Non-Fiction Films"; voted # 3 in 2005 by Channel 4's polling of "50 Greatest Documentaries"
Hoop Dreams (1994) - the highest-grossing documentary until 2002; influential in changing how AMPAS voted for documentary films; also named the Best Film of the decade (1990's) by noted critic Roger Ebert; ranked # 4 in 2002 by International Documentary Association's "20 All-Time Favorite Non-Fiction Films"; voted # 11 in 2005 by Channel 4's polling of "50 Greatest Documentaries"
The Thin Blue Line (1988) - by Errol Morris, responsible for solving a murder case and helping to free a Texas death-row inmate; ranked # 2 in 2002 by International Documentary Association's "20 All-Time Favorite Non-Fiction Films"; voted # 28 in 2005 by Channel 4's polling of "50 Greatest Documentaries"
World in Action: Seven-Up! Series (1964 and following 1970-2005) - voted # 1 in 2005 by Channel 4's polling of "50 Greatest Documentaries"; ranked # 13 in 2002 by International Documentary Association's "20 All-Time Favorite Non-Fiction Films"
The Man With a Movie Camera (1929) - always a highly-rated documentary film; ranked # 19 in 2002 by International Documentary Association's "20 All-Time Favorite Non-Fiction Films"
Nanook of the North (1922) - the first feature length documentary ever made; ranked # 6 in 2002 by International Documentary Association's "20 All-Time Favorite Non-Fiction Films"; voted # 44 in 2005 by Channel 4's polling of "50 Greatest Documentaries"
Saturday Night Fever (1977) - ranked # 3 in Entertainment Weekly's "100 Best Film Soundtracks"; "Stayin' Alive" was ranked the # 9 song in AFI's 100 Years...100 Songs ("More Than a Woman" was in the Top 400); ranked # 41 in TV Guide's "50 Greatest Movies (On TV and Video)"; ranked # 83 in Film Four's compilation of the "100 Greatest Films of All Time"
A Hard Day's Night (1964) - ranked # 1 in Entertainment Weekly's "100 Best Film Soundtracks"; included in Premiere's "100 Most Daring Movies Ever Made" listing in October 1998; also noted in Entertainment Weekly's "100 Greatest Movies of All Time" book published in 1999 as "Just Too Beloved to Ignore", and mentioned in many unranked Top 100 lists, including The New York Times' "100 Recommended Children's Movies", Time Magazine's "All-Time 100 Best Movies", Mr. Showbiz' "Critics' Picks: 100 Best Movies of All Time" and Movieline Magazine's "The 100 Best Movies Ever Made"
Singin' in the Rain (1952) - the # 4 musical film in ABC-TV's "The Best in Film: The Greatest Movies of Our Time" in 2011; ranked # 5 in AFI's 100 Years...100 Movies (10th Anniversary edition) polling in 2007, a list of the 100 greatest English-language movies; ranked the # 1 Greatest Movie Musical in AFI's Greatest Movie Musicals of All Time polling in 2006; ranked the # 3 highest-rated musical in IMDb's top rankings of musical genre titles, voted upon by site visitors in 2017; voted # 6 in 2003 by Channel 4's polling of "100 Greatest Musicals"; "Singin' in the Rain" was ranked the # 3 song in AFI's 100 Years...100 Songs polling in 2004; ranked # 25 in Entertainment Weekly's "100 Best Film Soundtracks"
Schindler's List (1993) - ranked # 8 in AFI's 100 Years...100 Movies (10th Anniversary edition) polling in 2007, a list of the 100 greatest English-language movies; ranked the # 3 epic film in AFI's 10 Top 10 polling in 2008; ranked # 4 in 2005 in the Channel 4 poll of the "100 Greatest War Films"
All Quiet on the Western Front (1930) - ranked the # 7 epic film in AFI's 10 Top 10 polling in 2008; Received Best Picture Oscar; ranked # 54 in AFI's 100 Years...100 Movies polling in 1998, a list of the 100 greatest English-language movies, ranked # 33 in 2005 in the Channel 4 poll of the "100 Greatest War Films"
Battleship Potemkin (1925) - see earlier in "Foreign Language Films"